INWOOD — Lucky Louie wasn’t so lucky over the weekend. Comedian Louis “C.K.” Szekely, known for his comedy routines and TV shows "Lucky Louie" and "Louie," had his Labor Day weekend joy ride on a yacht cut short when the boat got stuck in the mud off the Harlem River in Inwood Hill Park., according to law enforcement sources. The funny man was reportedly riding around the island with his two daughters when the boat got stuck in the muck at around 2:30 p.m. Sunday. The boat sat stranded for hours until high tide when it was able to motor away. Szekely, who lives on the Upper West Side, could be seen standing cross-armed on the deck of the boat with his daughters while waiting for the tide to turn, locals reported. His visit made a splash on Facebook and Twitter as locals caught word that the comedian was aboard the stranded vessel. "Gosh — if we'd known we would have swum out and brought him a picnic....we love him," Amanda Sullivan wrote on the Inwood Community Group on Facebook. The boat is the second vessel to get stuck in the salt marsh in just two weeks. Three jet skiers were stranded for hours on Aug. 18 until they were able to ride out when high tide returned. "#inwood slow learner's. 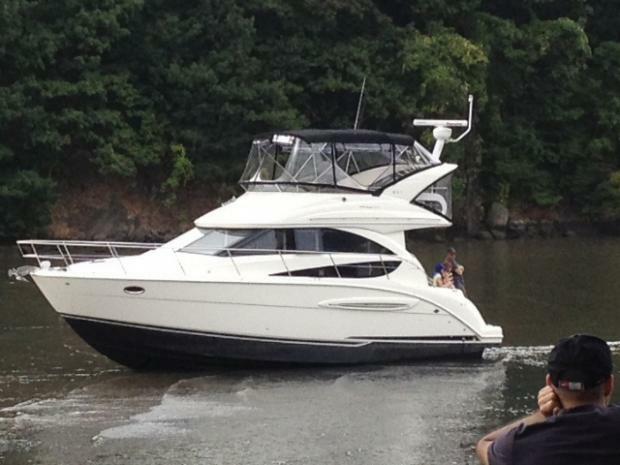 Last week a jet ski this week a whole boat," tweeted @duponte. The comedian wasn’t the only star to visit Inwood over the holiday weekend.